All through the year shopping goes on without any pause, no matter what season it is, we go out of our cozy homes and wander shop to shop to purchase our favorite goodies, basic necessities and groceries etc. men and women both share this common craze called shopping. In the summer scorching heat, in the mist and fog of winter, in the chill winds of spring, in the snowfall of December, we can’t stay at home but to run like rats out of the burrow for shopping. The bonus hits the nail right on the ground when it is the time of sale or other vigorous discount packages. Shopkeepers and sellers at the end of the season offer their discount packages and sell items on cheaper prices to get rid of the stock by the end of the season. Sale items are embossed with sale/discount badges in order to draw people’s consideration and to grab their first hand attention to make the buyers know that every cheap item is now at their disposal with special discounts. 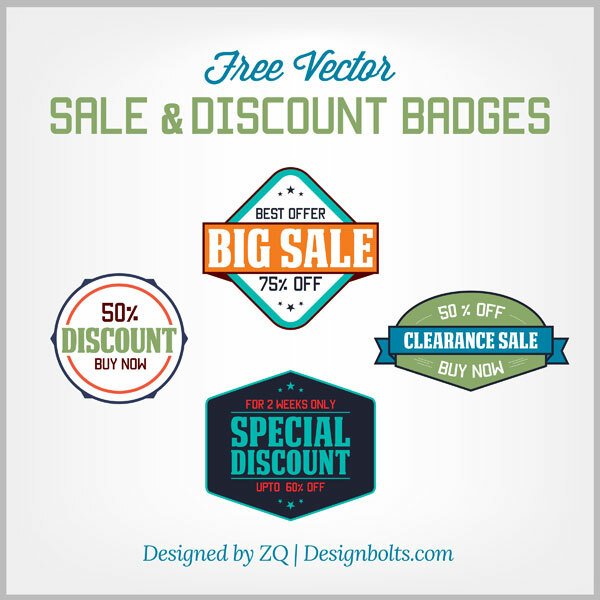 Today I am giving you free Vector sale & discount badge in ai format. These badges can be altered, manipulated and modified according to commercial needs. Scroll down and get the gaze! Subscribe us for more Free Mock Ups, free PSD and free Vectors. Thank you very much. nice vectors.